Like every Tuesday, it is Speedy Tuesday! If you own a Speedmaster, or a Speedmaster is part of your watch collection, at least wear it on Tuesdays! It is also a very good reason (or excuse) to purchase a Speedmaster – new, pre-owned or vintage – of you don’t have one yet. This week’s Speedmaster is the new Speedmaster Racing. 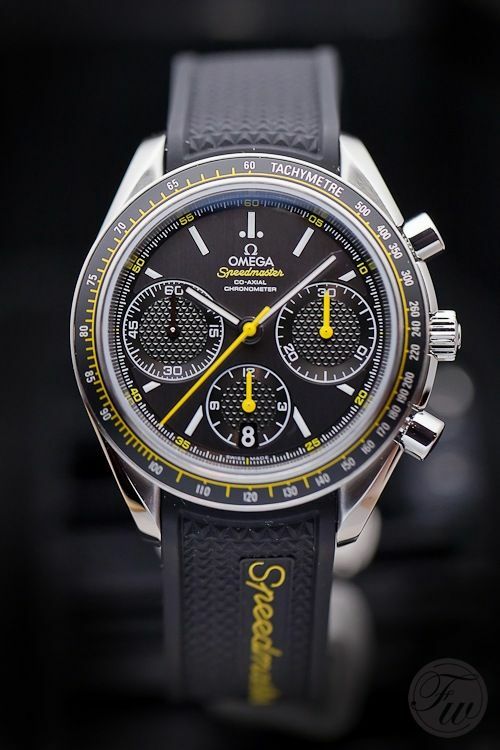 We’ve seen it during the BaselWorld 2012 show, when OMEGA showed it to us in their press booth. Luckily, every year OMEGA takes the time to give us a private viewing of their new collection. 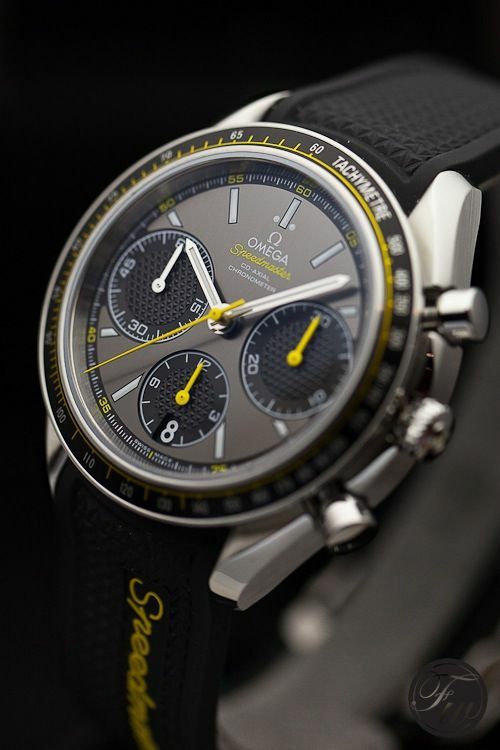 One of the watches that caught our attention was this new Speedmaster Racing. 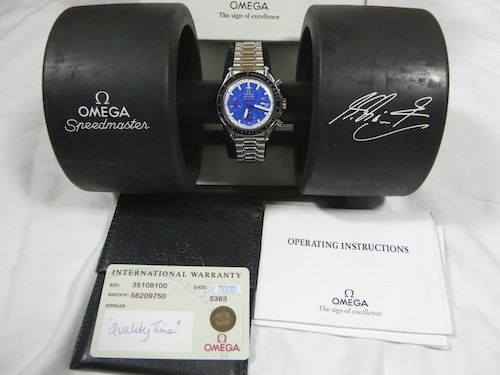 We say ‘new’, because there have been Speedmaster ‘Racing’ models in the past as well. 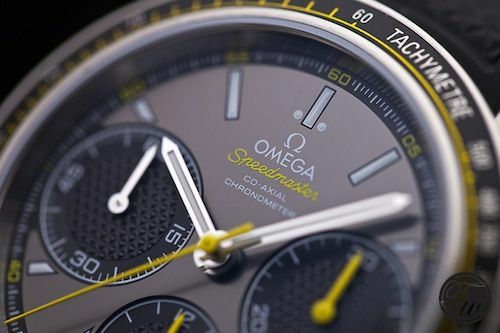 Like this new model, it is based on the Speedmaster ‘Reduced’. A nick name given to the Speedmaster Automatic by Speedy enthusiasts like ourselves, as it measures ‘only’ 40mm in diameter instead of the 42m diameter the Speedmaster Professional has. You should know that some years ago, there was not as much to choose from in the Speedmaster collection as there is now. You either picked a Speedy Pro or a Speedy Reduced. For some people, another advantage of the Reduced was the fact that it had an automatic movement. Anyway, we are drifting away from the Racing model. One of the previous Racing models was also based on the Reduced and funnily enough, it was the choice of Michael Schumacher in those days (late 1990s/early 2000s). They were available in various colors (red/yellow and blue) and came in this very cool special packaging, that looked like the wheels of an Formula 1 racing car. See below. The new Speedmaster Racing is already quite popular, as we’ve seen a lot of requests for its availability and pricing on Facebook pages and in forums. This reduced Speedmaster has an automatic movement (caliber 3330) and like we already mentioned, has a wearable 40mm diameter. The caliber 3330 movement has a co-axial escapement and a silicium balance and spring. Furthermore, the movement has been COSC certified, meaning it is very accurate and has an average deviation of -4/+6 seconds a day. This watch is available on a very cool black rubber strap with yellow writing or with a stainless steel bracelet. The rubber strap has a nice folding clasp, as shown below. 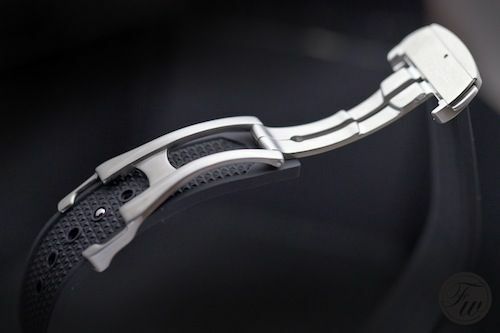 The price tag is 3500 Euro for the version with a rubber strap and 3600 Euro for the Speedy Racing on a stainless steel bracelet. The reference number to ask for at your local dealer is 326.32.40.50.06.001. Click here for an overview of all Speedy Tuesday coverage so far.